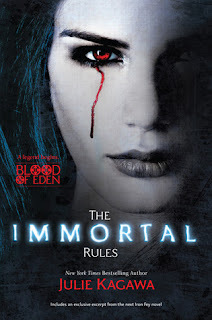 The Immortal Rules is a first POV story told by Seventeen year old Allison ''Allie'' Sekemoto. Allie lives in a post-apocalyptic era where vampires have pretty much taken over the world after a devastating virus called the Red Lung killed or turned humans and vampires into Rabids. Allie’s journey is broken into four separate but distinct parts: Human, Vampire, Monster and Wanderer. As a so called human Fringer, Allie scavenges, begs, and steals food from any one or any place she can find it. As an Unregistered, she and her motley crew are outside of vampire control and thus have no brands on their bodies telling others who they belong to. Allison lives on the outermost circle of a vampire city known as New Covington where the Prince rules with an iron fist. Humans are slaves and food to the vampires who rule the world. In return for food, they are forced to give blood to their vampire masters on a regular basis. Failure to meet a donation quota can mean forced bloodletting by human pets and thralls. Allison’s mother was a so called Registered before her death and thus forcing Allison to flee to the streets. For Allison, her life as she knows it ends after she returns from beyond the wall on a scavenging mission with her crew. After she is attacked and bitten by Rabids, she finds a mysterious vampire who gives her a chance: Die as a human and keep her soul, or turn into the one thing that she absolutely despises; a vampire. Upon waking as a vampire, and learning that her new vampire “sire” is known as Kanin, Allison realizes that life as she knows it has just gotten a little more interesting as well as challenging. Kanin advises Allie, “Sometime in your life, Allison Sekemoto, you will kill a human being, accidentally, or as a conscious, deliberate act. It is unavoidable. The question is not if it will happen, but, when. “This couldn’t be more prophetic. Vampire Allison learns that vampires can go two weeks between feedings, but if they go longer than that, The Hunger, will drive them to kill or madness, which in this case are humans for which Allison is now dependent on for her survival. She also learns from Kanin everything she needs to know in order to survive as a vampire before they are forced to part and go their separate ways. Allison, in my opinion, is a much more interesting character than Meghan Chase of the Iron Fey series. It’s not just because this is a vampire story either. I love her straightforwardness and attitude of trying to help others. I loved watching her struggle with who she is now as a vampire while trying to maintain a human facade in front of other humans. I also loved watching her in action with her Katana as she defends the humans she meets along the way, and even takes on her vampire “Brother” when given a choice between vampires and humans. In the first book of her new Blood of Eden series, Kagawa’s world building is extremely interesting and vivid in detail. I know there are other vampire apocalyptic books available on the market, yet I can’t seem to be bored by them. If they are well written by the author, then the audience will eat them up like turkey on Thanksgiving Day. This is the case with the Immortal Rules for me. Sub characters such as Ezekiel “Zeke” Crosse; give the story another layer to unveil. Zeke could be this series Patch in that there seems to be an attraction of epic proportions waiting just below the surface for something to happen. Zeke is fiercely loyal to his group of wandering humans. Even after discovering Allison’s true identity as a vampire, the lure of romantic entanglement isn’t far from the surface. Of course, when it does rise up, you are left wondering where Kagawa is going with this series. I also liked the vampire master Kanin who had more than a few secrets of his own including his own actions in regards to the Red Lung Virus. Allie and Kanin are two sides of the same coin in regards to their toughness and no nonsense approach to getting things done. There is another layer of my likability towards this first book. The vampires are nasty pieces of work, and the Rabids are even scarier if that is even possible. The vampires don’t shine in the sun, nor do they drink blood from deer and other animals. They are blood thirsty and that’s the way I like my vampires. Naturally, as the first book of the series, there will be questions left hanging like what happened to Kanin after Allie and he parted? However, I am most definitely looking forward to continuing reading about Allison's journey in the next installments. Your review makes the book sound really interesting. I really liked Meaghan Chase from Iron Fey and from your thoughts I have a feeling I'll Allie even more! I like how Allison is a normal, if dirty and starved, girl. Many dystopian novels try to have people still be super beautiful on the brink of the apocalypse, and I just don't care for that. Dystopian novels should be more about survival than appearances, and this one sure is. Allison has eaten rats and maggoty bread, so she's no delicate, shrinking violet. She's also intelligent! Allie knows how to read in an age where books are forbidden by the vampire overlords, and even the human rebels who might be brave enough to read won't do it because reading is not a survival skill. Words are not as important as food. But knowledge and words are part of what helps us stay human in times of severe trouble, and Allie recognizes this. I love the harshness of the world, and the mix of urban decay and rural wildness. It reminds me positively of Enclave by Ann Aguirre, which is really my standard for grittiness in YA dystopians (Divergent by Veronica Roth is my standard for cool worldbuilding in YA dystopians). The atmosphere of tension and terror leaves the reader always wondering if something's coming for Allie, and that's very engrossing to read.